Nicollet Mall is an outdoor pedestrian-friendly transit mall in downtown Minneapolis. It is an urban hub of shopping malls, restaurants, bars, arts, and entertainment. After 28 months of construction, the mall completed a $50 million makeover in the fall of 2017. As the third renovation in 50 years, the new mall was designed by James Corner Field Operations, the masterminds behind New York City's famous High Line park. Nicollet was redesigned with the hopes of injecting more than $100 million in new revenue, add nearly 3,000 jobs downtown, and increase property values in the area by $57 million. One of the redesign's most anticipated features was the Nicollet lighting system, including the Light Walk, Nicollet Lanterns, and street light beacons. The Light Walk—a two-block-long overhead installation made from mirrored fins and programmable LED lights—brings light, color, and movement into Nicollet Center, and is the center of the area's lighting events schedule. Nicollet Avenue has been downtown Minneapolis' shopping district and civic "Main Street" for more than 100 years, since stores such as the now-defunct Dayton's opened at the beginning of the 20th century. It saw the transition between horse-drawn carriages to cars parked in front of its eclectic storefronts. Nicollet Avenue's fortunes declined in the 1950s with the nationwide trend of shopping centers and residential neighborhoods relocating to the suburbs. Then, in the 1960s, skyways were built throughout downtown Minneapolis, connecting offices and residential buildings and removing pedestrian traffic from the city streets. These enclosed skyways also kept people warm in the middle of Minnesota's frigid cold winters. The Minneapolis Skyway System is the largest, contiguous system of enclosed bridges in the world, composed of around eight miles of pathways connecting 80 city blocks. In 1968, in an effort to bring shoppers back to downtown Minneapolis, eight blocks of Nicollet Avenue were closed to car traffic and converted into Nicollet Mall. Trees, benches, and street art were added as a nice landscaping touch to brighten up the area, and sidewalks were expanded and curved to form a more pedestrian-friendly shopping area. These changes made Nicollet the first transit mall in the country, inspiring other similar malls to pop up in cities like Denver and Portland, Oregon. Nicollet Mall is part of a thriving commercial district. Minneapolis Central Library, a striking modern building, anchors the north end, and Peavey Plaza is a busy public space at the south end. 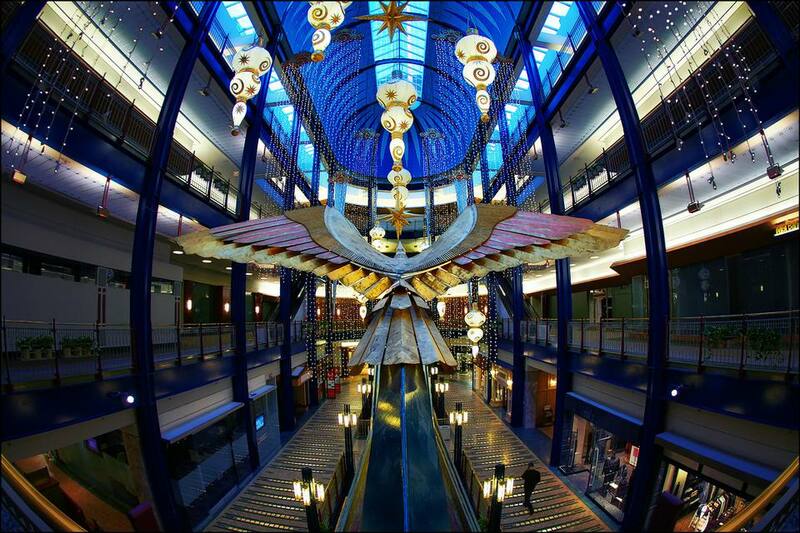 You can also go on your own walking audio tour of Nicollet Mall to learn more about its important architecture and public art. True to a mall, there are many opportunities for retail therapy here. Gaviidae Common, an indoor mall spanning two blocks, is on the east side of the 500 and 600 blocks of Nicollet Mall and has several independent stores, national retailers, and designer discount stores. Crystal Court, the foyer of the IDS Building, the tallest Skyscraper in Minnesota, has more shops and restaurants. There's also a Target store. Every Thursday and Saturday during the summer, a farmers market operates on Nicollet Mall. In addition to many chain restaurants and coffee shops, there are several independent places to eat and drink. Nicollet Mall's most famous tenant, Brit's Pub, is a large British pub with one of the best rooftop patios in the Twin Cities. The Local is a popular Irish pub one block up from Brit's, D'Amico and Sons is a popular Italian restaurant, and Barrio is a tequila bar and Mexican restaurant. Peavey Plaza is the venue for free concerts on summer evenings and weekends. Orchestra Hall, sharing the same city block as Peavey Plaza, is the home of the Minnesota Orchestra. In December, Holidazzle, a beloved Minnesota holiday tradition, lights up Nicollet Mall. There are many recurring events that can be found year-round at Nicollet. These include art pop-ups, farmers' markets, street fairs, free concerts, free outdoor yoga and fitness classes, story time for children, and annual plays at the amphitheater, called the Nicollet Theater in the Round. The Hiawatha Light Rail Line has a stop at the north end of Nicollet Mall. Several Metro Transit bus lines serve some or all of Nicollet Mall. If you're driving, there is plenty of parking in downtown Minneapolis, but be aware that many of the lots are expensive.